This is a true Christmas ghost story from my childhood days. the handle towards my hand? “No, no, no, Church you’re hopeless!” shrilled Miss Powell in exasperation. The cast enjoyed the opportunity to laugh, while smouldering with resentment I put down my large sheet of tin and removed the wicket-keeper’s gloves lent to me by Towser Bailey to protect my hands. In my eyes, it was yet another instance where teachers would never let you do anything that hadn’t been done before. I quite liked the slender Morag, Miss Powell, ‘Miss 1485’; I had really wanted to be in the school play, but Miss Powell, witnessing both my stammer and my cavalier improvisation on the text, had reluctantly put me in charge of sound effects. We called her ‘Miss 1485’ because, as our History teacher, she would stand in front of the class and proclaim in lilting Welsh rhetoric that: “Modern History started in 1485 with the House of Tudor; remember the date, write it in your books, and let it permeate your brain,” her accent tripping over the syllables to give it a lyrical effect. This proclamation was always delivered with a Welsh passion, and by the end of term we had heard it so often that the class could be seen silently mouthing her words in unison. My creativity rejected, I wandered off down to the props cupboard at the end of a darkened corridor. It was there I had what I thought was a brilliant idea. Folded up neatly in the corner of the cupboard was a large white sheet. I opened it out. At this point, no doubt, a picture is emerging in the reader’s mind, and I will therefore fast-forward to the Headmaster’s Study, where, from a cane of my own choosing, “not the flimsy one, Church,” I received three brisk strokes for the disruption of the Drama class. And that, I am sad to say, drew a veil over my theatrical aspirations. Redirecting my thwarted but relentless enthusiasm, I turned my attention to another form of education – cigarette cards! These were always popular at Goldsworth School, and the game most played entailed flicking the cards between your first and second fingers against a wall about six foot away. The cards stayed on the floor until a player covered one with another card, at which point he picked them all up. Down one side of the playground there were two large covered alcoves for children to shelter under in bad weather and these made ideal pitches for fag-card contests. Most of the boys held a stock of around 100 cards and some had a few sets, often given to them in albums by their parents. On one particular play break, during squally conditions, I was engrossed in a game of fag-cards with two other boys – Peter Hapgood and Alfie Parker – otherwise known as the ‘conker kings’. But this being February and with not a conker in sight, they had decided to inject a bit of pace into our sport by lobbing in thruppence a game. As fate would have it, Miss Powell was on playground duty that day, and seeing the three of us settling our bets, came over to investigate. Now whether Morag was from Chapel stock, I cannot say, but she took a dim view of our sporting activity, equating it to gambling. Calling the three of us together, she asked to see the cigarette cards. Peter and Alfie seemed to have a number of trees and wildlife on their cards, and cheekily, I suggested it helped them with their Nature Study. Unfortunately, mine were predominately jockeys and boxers. “You’re not going to learn a lot from those Church,” she frowned, and I feared she might confiscate my pack. “They’re all part of history Miss,” I protested. “Take this one, Jimmy Wilde – World Flyweight Champion – one of the bravest men ever to come out of the Rhondda Valley, and only 7 stone 2 lb.” I prayed that the Welsh connection would get me a reprieve. Surprisingly, she picked up on the history connotation. To tell you the truth, all I knew about Jimmy Wilde was written on the back of that card. I now had until Thursday afternoon to get the low-down on him. Perhaps Dad or one of my Uncles could help me? It turned out that Uncle Arthur – the ex WW1 Sergeant, with bushy eyebrows and a shell-shocked stammer – was best informed. And so with patience, a pen and notepad on my part, and a glass or two of Nan’s Sandiman’s Sherry on his, I learned enough of the man to last five minutes. To begin with, I was very nervous, but apart from Miss Powell, ‘Miss 1485,’ who had the cigarette card propped up on her desk, no-one else in the class knew much about Wilde. However, they were as usual eager for any diversion, and when my palms stopped sweating, after a while I was able to link up some of the facts and stories surrounding the man. I invited the class to visualise this tiny boxer in singlet and tights, fighting up to 25 bouts a day in fairground boxing booths, eventually to become the Flyweight Champion of the World. Thoroughly warming to my subject, I ended with a spirited demonstration of shadow boxing, telling them that he was known as ‘The Ghost with a Hammer in His Hand’. “Was he Banquo’s ghost?” chimed in Peter Hapgood. Laughter and some applause followed, with Morag promptly ending the lesson and giving me back my cigarette card – Number 39 of Churchman’s Boxing Personalities. Twenty years later, scanning the sports pages one morning before going to work, my eyes were drawn to the heading “Jimmy Wilde – World Flyweight Champion Dies”. It went on to report that Wilde started out as a coal miner in the Rhondda Valley, but at the age of 16, he began fighting in boxing booths, usually against much heavier opponents. In a professional career spanning 13 years, he won a remarkable 146 of his 149 fights, 99 by knockouts. He died aged 77. This pale and frail looking man concealed so much strength he was known as ‘The Ghost with a Hammer in his Hand’. It all sounded so familiar. There was no picture accompanying the report, but I remembered exactly what he looked like – a ghost from the past. available with a few of his other books under Books For Sale. This is the tale of two great horses who vied for supremacy in the seasons 1880-81. The Prince – Bend Or, was bred by Hugh Lupus Grosvenor, 1st Duke of Westminster, at his Eaton Stud in Chester, with a Classic pedigree. His sire, Doncaster, won the Derby in 1873 and his dam, Rouge Rose, was a daughter of the 1860 Derby winner, Thormanby. The pauper – Robert the Devil, bred by Charles Brewer, was by the sprinter, Bertram (1872 King Stand Stakes), out of the apply named, Cast Off, by The Promised Land (1862 2,000 Guineas). Cast Off had been barren for many years before mated with Bertram and was left on the Cambridgeshire Fens at Wickham to fend for herself, until Robert the Devil was foaled. Bend Or, a chestnut with a white blaze on his face, later stood 16.1 hands with a girth of 74 inches. As a two-year-old he was unbeaten in five races, including the Richmond Stakes at Goodwood and the Prince of Wales’s Stakes at York. Meantime, Robert the Devil, a “slashing” bay horse of 16.2 h.h. had won both his starts as a juvenile, including the valuable Rous Memorial Stakes at Goodwood. The following year, Robert the Devil, starting at odds-on, was beaten a head in the Biennial Stakes at Newmarket, while Bend Or, not entered in the Guineas, waited for Epsom. Bend Or’s Derby in 1880, was regarded as the race of the century, albeit in the run-up to the race, the favourite’s connections suffered great anxiety. First, Bend Or developed sore shins, which had to be treated day and night. Secondly, Fred Archer, booked to ride the colt, was badly savaged by the four-year-old Muley Edris and put on weight whilst under treatment for badly torn arm muscles, scaling 14lb overweight four days before the Derby. However, all the problems were resolved in the nick of time. Archer had a saddle made weighing only a pound and on the day with the help of a purgative known as “Archer’s mixture,” weighed in at the required 8st 10lb. Archer, in a drive to gain the rails position, had to raise his left foot level with Bend Or’s head to prevent crushing it against the rails. His determination saw him through and he made up ground on Robert the Devil to the distance. At this point, although well clear, Rossiter looked back to see Archer bearing down on him with every stride, and immediately appeared to lose his nerve, until the two colts passed the post together. After an agonising wait, the number 7 was displayed on the Stewards Stand, indicating Bend Or was the winner. Twelve lengths behind, Mask finished a bad third. 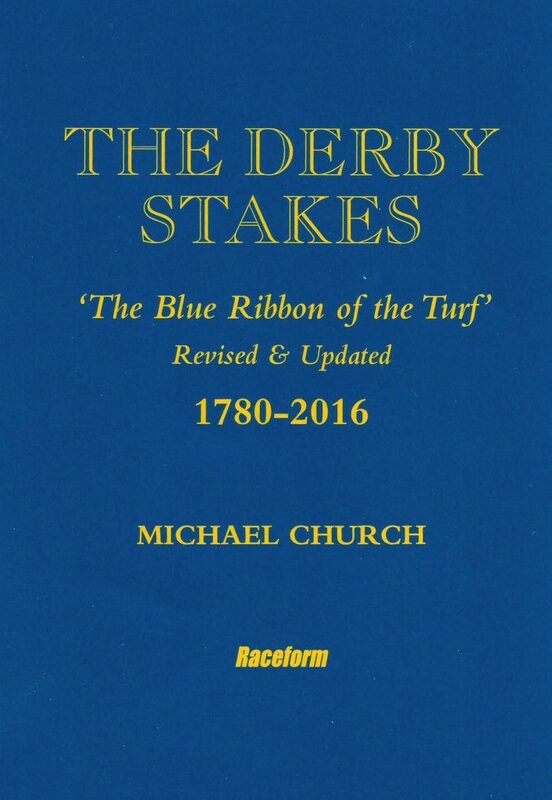 On July 15, Charles Brewer, the popular bookmaker, who owned Robert the Devil in partnership with his trainer Charles Blanton, wrote to the Epsom stewards objecting to Bend Or on the grounds he “was not the horse which he was represented to be, either in the entry or at the time of the race”. Their information was that Bend Or and Tadcaster (by Doncaster out of Clemence, by Newminster) had been mixed up in their journey from Eaton to Newmarket and from Newmarket to Robert Peck’s stables in Russley, Wiltshire. In later years, however, one of the stewards, James Lowther, revealed that addition facts had come to his knowledge that had led him to doubt their decision. Then in 1914, after a series of articles in Horse & Hound and the Bloodstock Breeders Review, several pieces of evidence came to light that supported the stewards’ decision, as Tony Morris later reported in the Thoroughbred Owner & Breeder. Eleven days after the Derby, Robert the Devil travelled to France to win the Grand Prix de Paris. He then followed up with victories in the St Leger, connections winning £80,000 in bets, the Cesarewitch and Champion Stakes, adding the Ascot Gold Cup and the Alexandra Plate as a four-year-old. Bend Or went to Ascot to win the St James’s Palace Stakes, then ran unplaced in the St Leger behind Robert the Devil. He was then beaten a head by Robert the Devil in Newmarket’s Great Foal Stakes and slaughtered by him in the Champion Stakes, when going down by 10 lengths. The following year, a revitalised Bend Or, returned to Epsom to win the City and Suburban Handicap, carrying the top weight of 9st. 0lb, from 23 rivals. The final encounter of Bend Or and Robert the Devil took place in the Epsom Gold Cup (forerunner of the Coronation Cup), where the pair having deterred all opposition, ran a match. And although odds of 4-6 were laid on Robert, after a thrilling dual, Bend Or beat his arch-rival by a neck. Bend Or ran twice more, winning the Champion Stakes from Scobell and Iroquois, then finally, in the Cambridgeshire, under Fred Archer and 9st 8lb, he gave way after a brave run. After dominating the racing scene for two years the Pauper beat the Prince by three races to two. However, in Bend Or’s defence, his victory’s in the Derby and Epsom Gold Cup were each heralded as the race of the year. Bend Or retired to stud at Eaton at a fee of 50 guineas and in his first crop got Ormonde (b.c. 1883), winner of the Triple Crown and Kendal (ch.c. 1883), the Champion Sire of 1897, through the efforts of his Triple Crown winner Galtee More. Unbelievably, the victory’s of Ormonde were not enough to make Bend Or the Champion Sire of 1886. His total stakes won of £22,803, were just £14 short of Hermit’s, who became Champion Sire for the seventh time. Bend Or died on 10 January 1903, aged 26. By contrast, Robert the Devil failed to produce a notable offspring and died of an abdominal malady in 1889. After his death, he was prepared by a taxidermist and remains on show at Gibson’s Saddlery in Newmarket. 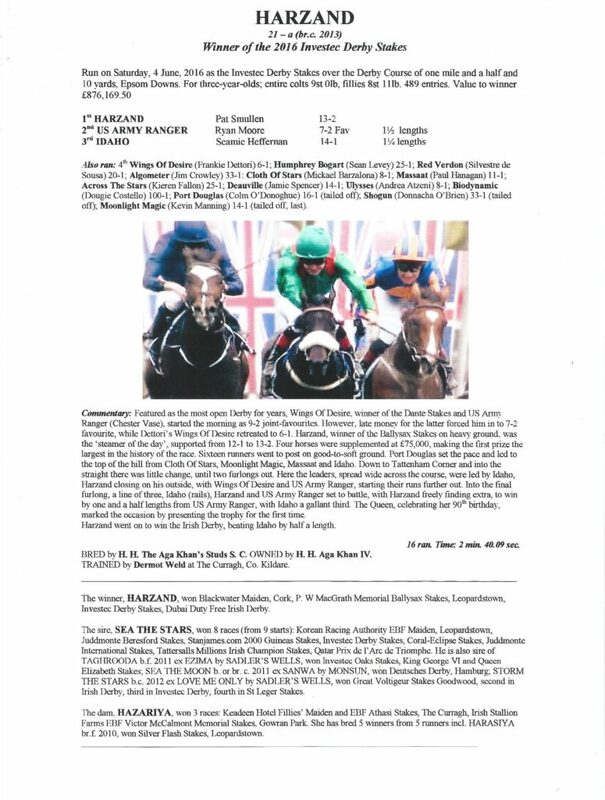 As a surprise postscript to this story, a recent DNA comparison of Bend Or to the Tadcaster family, continued the investigation, as Tony Morris reported in the Thoroughbred Owner & Breeder. And so, we are to believe that if the Epsom Stewards of 1880 had miraculously been in possession of the DNA samples, Bend Or would have been disqualified as a fraudulent entry and Robert the Devil would have been awarded the Derby. And so ends a turf Tale of the Unexpected. Very soon all roads will lead to Cheltenham. However, many of those who make their annual pilgrimage to the jumping Mecca, will have had to reshuffle their commitments. Father Green, travelling from his East End parish, was one such enthusiast, borne on by the hope of an anti-post double, then dragged back on the wave of conscience. This story is taken from, The Gambling Adventures of Father Green. Father Perry looked out on the paddock at Cheltenham; it was Thursday, March 18, 1982 – Gold Cup day. The answers as to how he had got there and what the repercussions would be, he preferred not to think about, at least until after the Gold Cup. Just before the King George on Boxing Day, he had placed a tenner bet on Silver Buck at 3-1, doubling it with him winning the Gold Cup at 12-1. A copy of his bet, still intact after the first leg, and showing £510 to £10, was safely in his trouser pocket. He checked his watch, 3:15 – 15 minutes to post time. Time to look at the principals, as the field of 22 runners encircled the paddock. And what a star-studded field it was. Night Nurse, twice a winner of the Champion Hurdle, heading the market at 11-4; Diamond Edge (Hennessy Gold Cup), Tied Cottage (the disqualified 1980 Gold Cup winner), and a host of other fancied contenders – Captain John, Grittar, Venture to Cognac, Royal Bond and Silver Buck’s stable companion Bregawn – a veritable who’s who of steeplechasing. As the runners filed out onto the course, Father Green made haste to find a vantage point, but he had left it too late. Every step with a view was taken, and so reluctantly, he stood at ground level, mid-way between the last fence and the winning post and relied on Peter O’Sullevan’s commentary. From two fences out, Perry could hear that four horses – Silver Buck, Bregawn, Sunset Cristo and Diamond Edge, had the race between them. Then, over the last, Silver Buck went on from Bregawn, Perry, now unaware he was shouting and jumping up and down in pogo stick fashion to catch a glimpse of the final yards. He will tell you that what he saw – Silver Buck’s two-length victory over Bregawn – would stay with him for the rest of his life. It was 4 o’clock before his elation subsided. He hurried through the crowds to get to the carpark in the hope he would be lucky. “Let me see,” he thought, going though his pockets for the symposium programme, until finally pulling it out with his anti-post voucher. “Here we are….ah yes, 2 o’clock ’till 4, a lecture on the Early Popes, then 4.30 to 6.00 – Reincarnation and the Progression of Past Lives. Must try and get in for that during the interval,” he thought. And he did. Directing the cab driver to the Holy Name Hall, an offshoot of St Gregory’s Church in Cheltenham, he breathlessly rejoined the other Catholic priests. For this was a three-day symposium, run by the Dominicans, with the benefit of a Buddhist monk guest speaker. Father Perry, having successfully slipped in during the interval, was now gasping for some refreshment. However, after being introduced to the Lama, he was taken to a table offering the choice of some unusual vegetarian dishes and a selection of herbal teas. Deeply frustrated by drinks he could never understand or condone, he enquired if they had anything stronger, whereupon he was offered a brew of Chinese Oolong tea. Although at pains to graciously accept, he still found it necessary to discreetly add some brandy from his hip flask. Five minutes later, he joined conversation with the Dominican Father Matthew, and to his credit kept a straight bat by remembering the life of Pope Adrian, the only Englishman to occupy the papal chair, 1154 – 1159. Father Matthew had encountered Perry in the past and always regarded him with baffled suspicion. However, Father Green knew that the good priest was valiantly trying to understand his eccentricities. Sadly, after indulging in one or two more cups of Oolong a la Perry, he slept soundly through the lecture on reincarnation, only to be woken, by the rousing round of applause for the Lama at the end of question time. Earlier, having flown by the seat of his cassock to fast track to the racecourse, Perry was now on the spot for an ingenious reply. Miraculously, he was saved by the taxi driver’s knowing expression and exaggerated wink. Then, assuming the ride, Perry gratefully clambered aboard, turning to wave a cheery goodbye to the open mouthed Father Matthew.